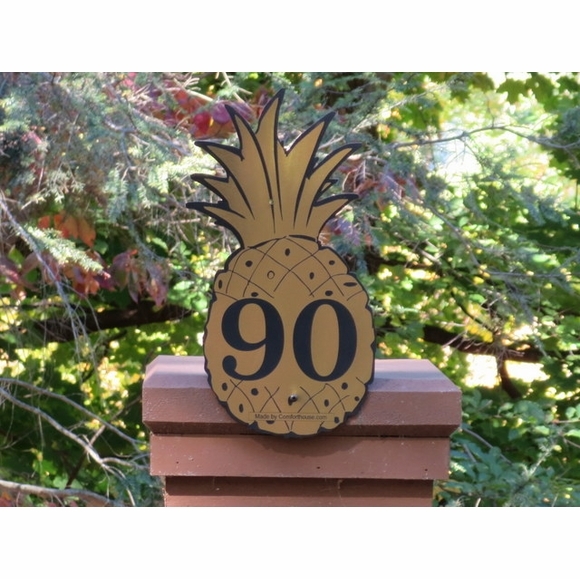 Pineapple Shape House Number Sign - - custom made address plaque in the shape of a pineapple. While other address signs feature a pineapple image, this address plaque actually looks like a pineapple. Made in USA. Comfort House exclusive address sign personalized with your choice of color and numbers you specify. Wall mount pineapple sign holds up to three (3) 3.5" characters including any spaces or punctuation. Note: the style number you see on the sample sign is for internal use only and is not part of your sign. Eight color combinations: sky blue with white characters; black with white characters; white with black characters; brushed gold with black characters (shown in large picture above); brushed stainless with black characters; kelley green with white characters; yellow with black characters; and red with white characters. Dimensions (approximate): 15"H x 8"W x 1/8". The pineapple is a traditional symbol of welcome and greeting and is a popular image on address or home signs. You can see some of our other pineapple signs in Related Products.